The Officers Training Academy needed a solution where Training Officers and Staff would be able to access and update data on their trainee Cadets both in office and in the field. Navyug Infosolutions created this Training Solution for the academy. It helped trainers to seamlessly monitor, assess, record and compare performance of trainees anywhere – in office and in the field. Trainers can enter data on their laptops during exercises and sync it with a central server on return. Reports and results are auto-generated. Since there was no internet availability in the field, the solutions required local storage of data on laptops in the field. This data would be synced with a central server later. A very simple user interface for easy use by untrained staff. Secure data interchange between laptops and Clients / Server. Ability to aggregate data at various levels and to generate results. Visits by the development team to finalize requirements. Balsamiq mockups were shared with the client to finalize details. Poker Planning, Agile methodology with daily standups, sprints and retrospectives were conducted. Test Driven Development was done. 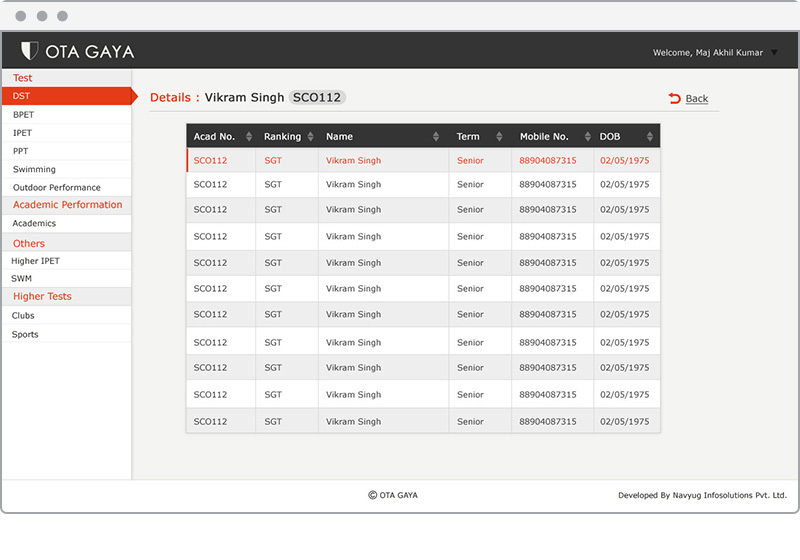 Maintaining data on all activities and tests related to training of Indian Army Officer Cadets. Trainers can enter data in the field on the laptops. Data can be synced with Servers at Academy level from Client machines in offices. Reports, including Graphical Reports can be generated. Results and Comparative performance of Cadets and Training Organizations (Battalions, Companies and Platoons) can also be generated. Code and Progress of work were shared with Client on Git and Trac respectively. Regular interactions were held with the Client, to ensure maximum communication. Trainers can enter and monitor data on their laptops even on the field and sync it when they get back. Various departments can manage data independently through Access Rules. Detailed Reports and Comparisons including Graphical Reports can be generated.